Check out the new IdeaJam Welcome Page. One of the most requested features we hear repeatedly from customers and prospects is "when will you have an API for IdeaJam like your IQJam knowledge exchange solution does?". Well we are now happy to say that IdeaJam 1.8 includes a comprehensive developer API. There are two sets of identical API's, one for web services and the other for JSON that allow developers to easily interact and extend IdeaJam programmatically. IdeaJam data can now be easily surfaced in other applications. The team at Elguji is extremely proud to offer these new capabilities to our customers and future customers. Our experience with providing developer API's for our products has paid off for both our customers and ourselves. addComment - Add a comment to an idea. addIdea - Add a new idea. findIdeaById - Find an idea by it’s IdeaJam ID. getIdeaSpaces - Get a list of IdeaSpaces. getRecentComments - Get a list of recent comments. getRecentIdeas - Get a list of recent ideas. getRecentIdeasByAuthor - Get a list of recent ideas for an IdeaJam participant. getRecentIdeasByTag - Get a list of recent ideas for a given tag. getStats - Get the number of ideas, comments, votes and IdeaJam participants. getTopInnovators - Get a list of the Top Innovators and their scores. getTopTags - Get a list of the top tags. getVotesForIdea - Get the list of votes for an idea. getWhatsHot - Get a list of the ideas that are currently hot. searchIdeas - Get a list of ideas for a given search term. Have a look at the Developers page on the Lotus Community IdeaJam site for more information on these methods. You will also find the Developer link at the bottom of any page on an IdeaJam site. We also provide a test page for developers to test out their JSON calls. The WSDL can be found here. All calls to the API are logged into an optionally configured OpenLog database. 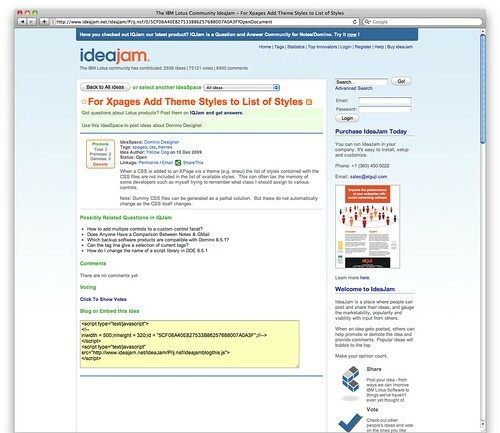 Open the IdeaJam developers API sample page. We put together a sample web page that demonstrates 12 of the 14 API methods using the JSON API. The API returns JSON objects which developers can then use to style and format any way they wish. We used MooTools in our sample page. The data being displayed on the sample page is coming from the the IdeaJam.net site. Well we hope you now have an understanding of the IdeaJam developers API and it's capabilities. We would love to hear from you and would be happy to answer any questions about the API, IdeaJam or any other Elguji software solutions. We are very proud of IQJam and are extremely pleased with it's success in the markeplace as the only full-featured question and answer social software for the IBM Lotus social software market. To see how you can integrate IQJam with Microsoft Office look here.